The company De tempore d.o.o. has been founded in 2002. and started its business with a Swarovski Partner Boutique in the center of Zagreb. Since then the company has developed its brand portfolio. As the name explains, de tempore (greek „at the right time“) has enriched the Croatian market from year to year with only the best of accessories, jewelry, crystal and fashion goods. Througout the past 12 years De tempore has introduced some of the most renowned world fashion brands to the Croatian market, as Givenchy, Rochas, Balmain, Elie Saab, Nina Ricci, Marc Jacobs, Coach, Sonia Rykiel, See by Chloé, Red Valentino, Swarovski, Crystals from Swarovski, Mawi and many others. To offer a complete shopping experience and only the best products, De tempore has developed two self-owned brands which are recognised by customers in Croatia. 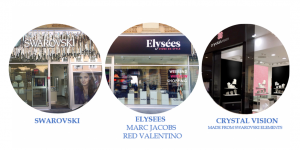 Elysées is a brand which charmingly portrays the most beutiful Parisian street: Champs Elysées, and with its fashion brings out the desireable french Vivre en style. Accessories, jewelry, clothes and footwear Marc Jacobs, Rochas, Coach, Sonia Rykiel and Red Valentino are synonyms for the irresistable french chic and flawless style. Crystal Vision is a brand which houses Croatian designed and produced jewelry, which is made exclusively out of Crystals from Swarovski® crystals, which guarantee impecable style, quality and origin, while ensuring the best value for money.